SFA is a firm believer that you can not only serve your customers, but you can learn a lot from them, too. That is why we love to chat with them about what they are up to on their shop floors, to help solve the problems they are having, and to also see why they chose a Manufacturing related career. 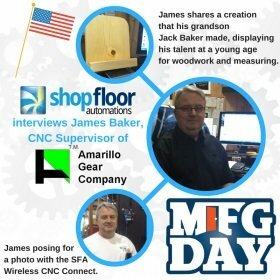 James Baker is a CNC Supervisor at the Amarillo Gear Company. Find them online at http://www.amarillogear.com/. Shop Floor Automations is an official endorser of MFG Day 2016. Interact with us on Twitter at @SFA_inc and use the hashtag #MFGDay2016 and you may also fill out our contact form.